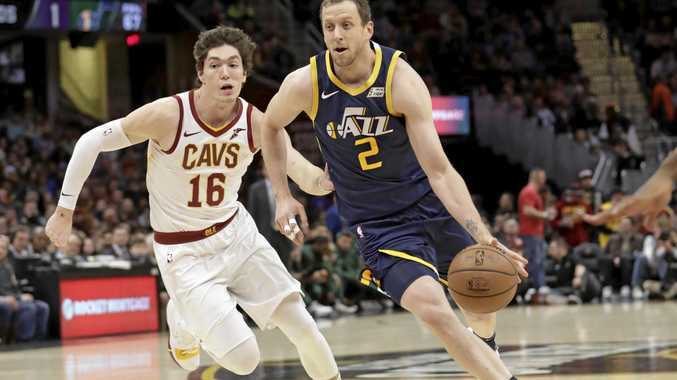 AUSTRALIANS Joe Ingles and Dante Exum joined in the scoring as the Utah Jazz sent the Cleveland Cavaliers to their eighth straight NBA loss with a 117-91 victory on Saturday (AEST). Cleveland (8-31) has the worst record in the NBA, with four of the losses in the streak coming by 20 or more points. Ingles hit 12 points and Exum 11 as the Jazz came back from a half-time deficit to outscore the Cavaliers 69-42 in the second half. The Cavaliers have struggled all season. Tyronn Lue was fired as coach after four games and Cleveland began the season 0-6. Superstar LeBron James left for the Los Angeles Lakers in the off-season and All-Star forward Kevin Love had left foot surgery on November 2. He has played in only four games. Australian Matthew Dellavedova missed the game for the Cavs with a sprained left foot. Elsewhere, Karl-Anthony Towns registered 29 points and 15 rebounds, and Jeff Teague added 23 points and 10 assists in his return to the Minnesota line-up in the Timberwolves' 120-103 comeback victory over the Orlando Magic. It was Teague's first game back after missing nine matches with an ankle injury. Hassan Whiteside scored 21 points and grabbed 18 rebounds as the Miami Heat scored a 115-109 victory over the Washington Wizards. And Boston never trailed in a 114-93 win over Dallas, with Jalen Brown (21) and Jayson Tatum (18) leading the scoring for the Celtics. D'Angelo Russell totalled 23 points and 10 assists as the visiting Brooklyn Nets made enough plays late in the game to record a 109-100 victory over the slumping Memphis Grizzlies. Victor Oladipo scored a game-high 36 points and the visiting Indiana Pacers held on for a 119-116 win over the Chicago Bulls in overtime. The Milwaukee Bucks beat the Atlanta Hawks 144-112, and the Los Angeles Clippers defeated Phoenix 121-111.